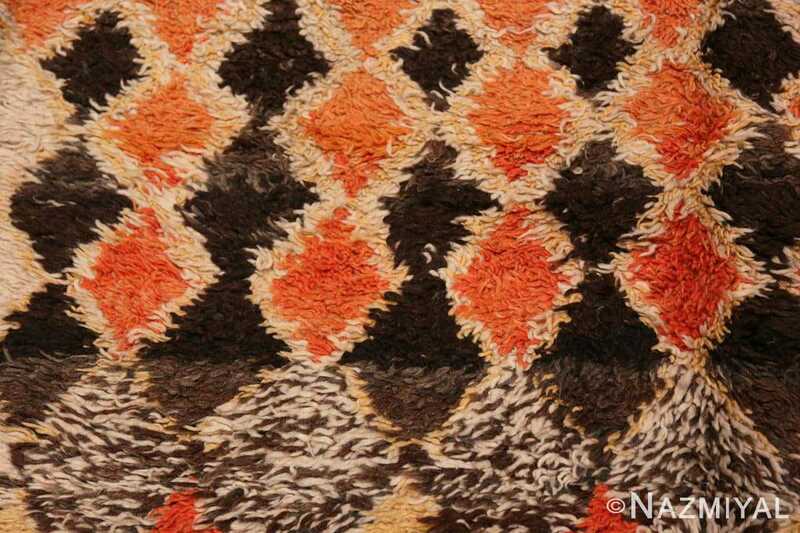 A dynamic and exciting mid-century Moroccan carpet, this tribal composition delights with an exciting pallet of rich tones. Magnificently Tribal and Colorful Tribal Vintage Berber Shag Moroccan Rug, Origin: Morocco, Circa: Mid 20th Century – Earthy browns and the fiery reds, oranges and yellows of the sunset dance across this striking mid 20th century vintage Moroccan shag rug. These artistic and tribal vintage Moroccan rugs became popular during the mid 20th century because they blended well with furniture by some of the greatest mid century designers as well as the works of the famous Bauhaus school artists. Today, they find their way easily into minimalist, modern Scandinavian and interior designs that feature natural and organic elements. 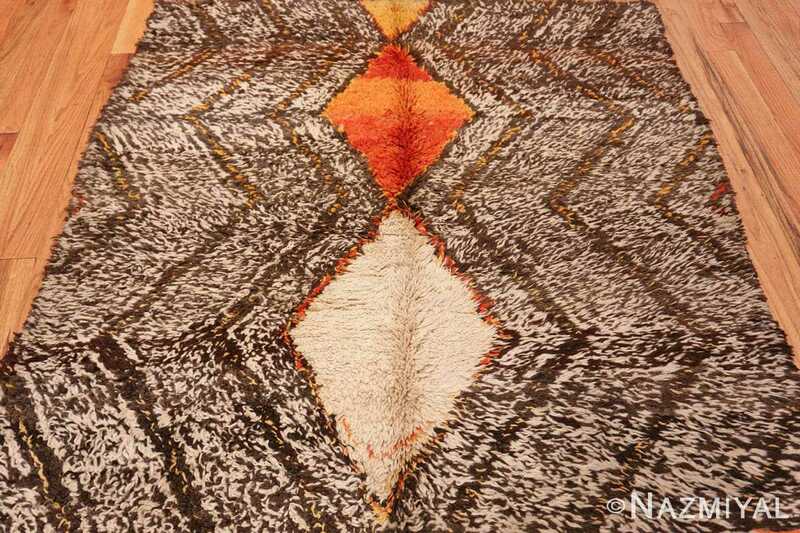 The abstract organic design is executed in a way that makes this vintage shag rug appear to be hand drawn, giving it a simplistic tribal quality. 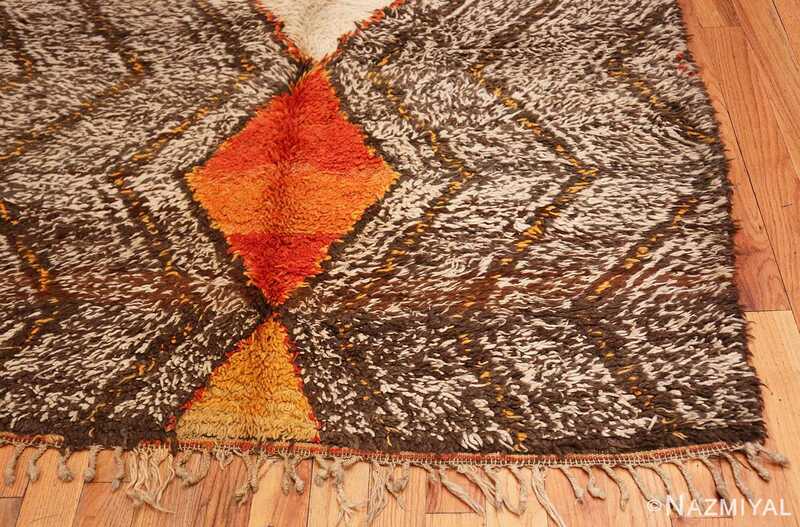 The design is only roughly symmetrical in the vertical direction and is divided into distinctive bands horizontally. 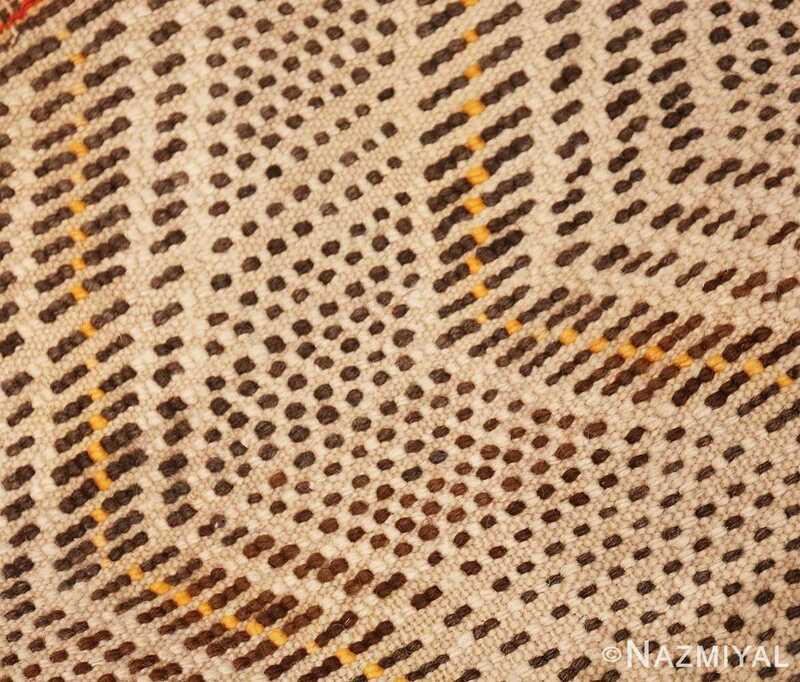 The color of the bands becomes less saturated as you work from top to bottom, with the diamonds at the bottom of this rare Moroccan Berber carpet only defined only by a chocolate brown outline. 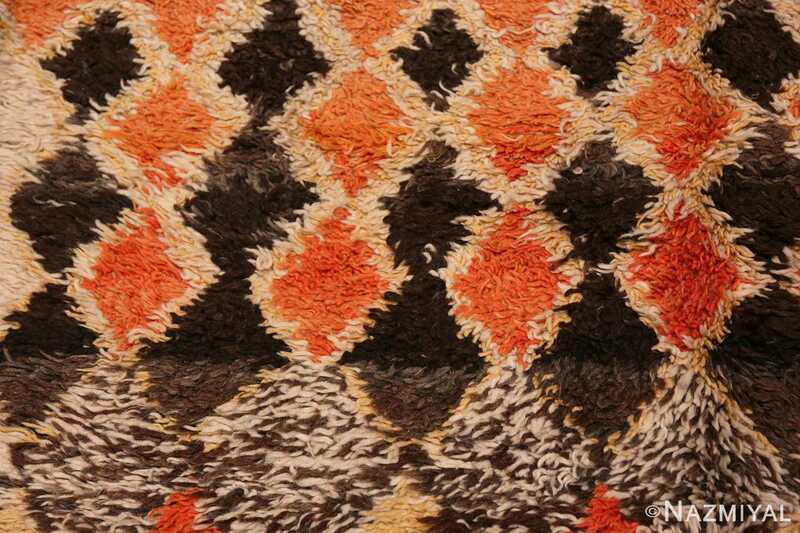 The design of this spectacular tribal vintage Berber Shag Moroccan rug works from larger diamonds at the top to increasingly smaller ones towards the bottom. 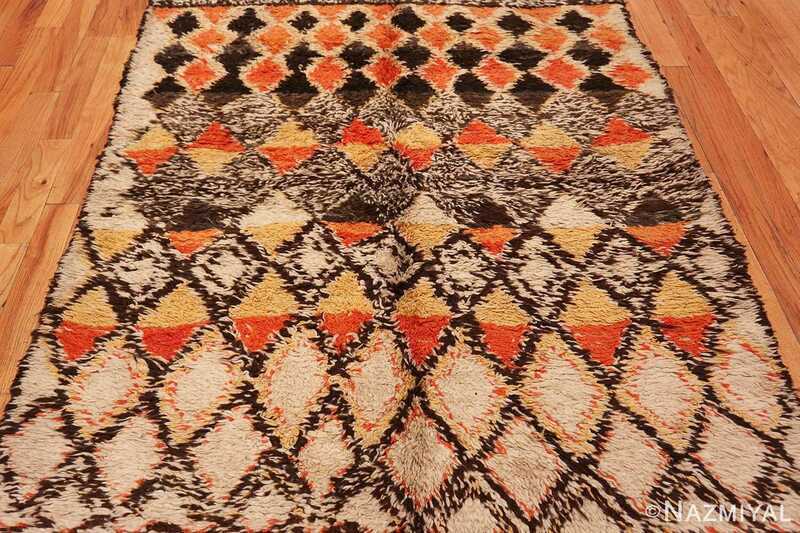 However, the vintage mid century modern rug could be situated in either direction, giving it a completely different look depending on the orientation of the broader and smaller diamonds. 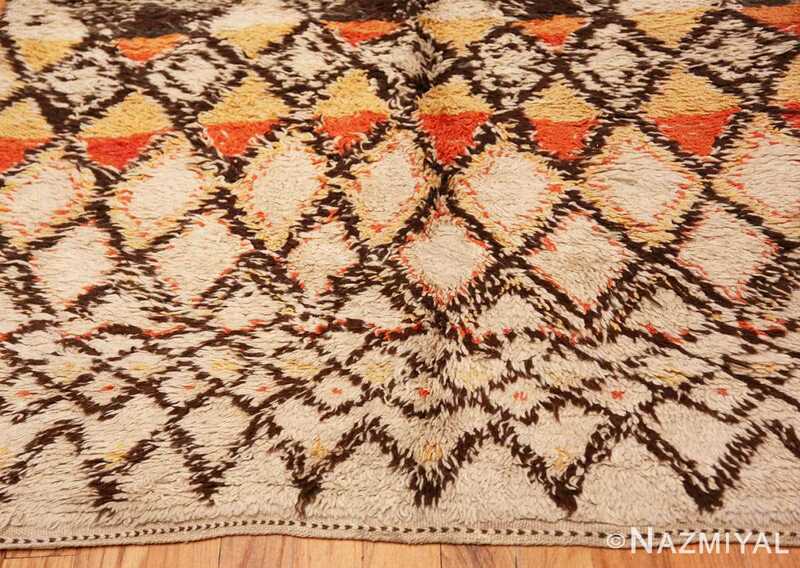 This magnificent tribal vintage Berber Shag Moroccan rug makes a bold statement and lends a splash of color to any contemporary or retro design. 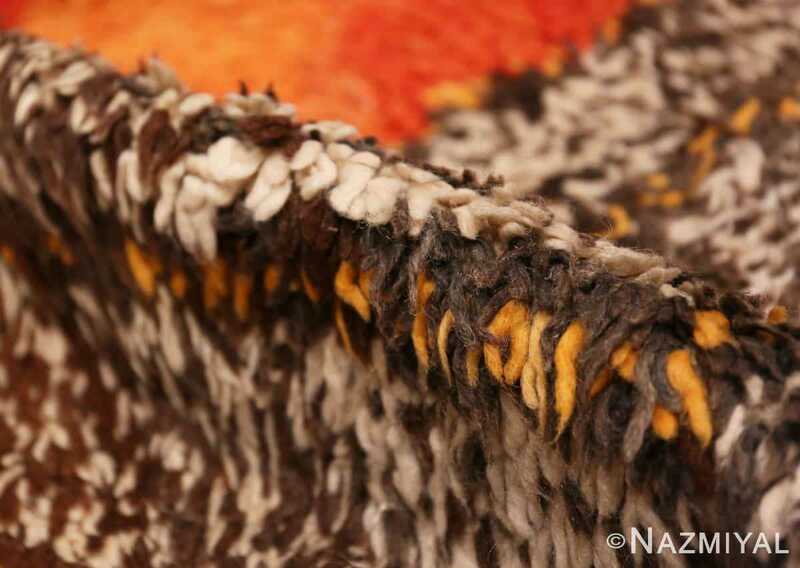 Vintage Moroccan carpets are known for their plush feel and unique qualities. 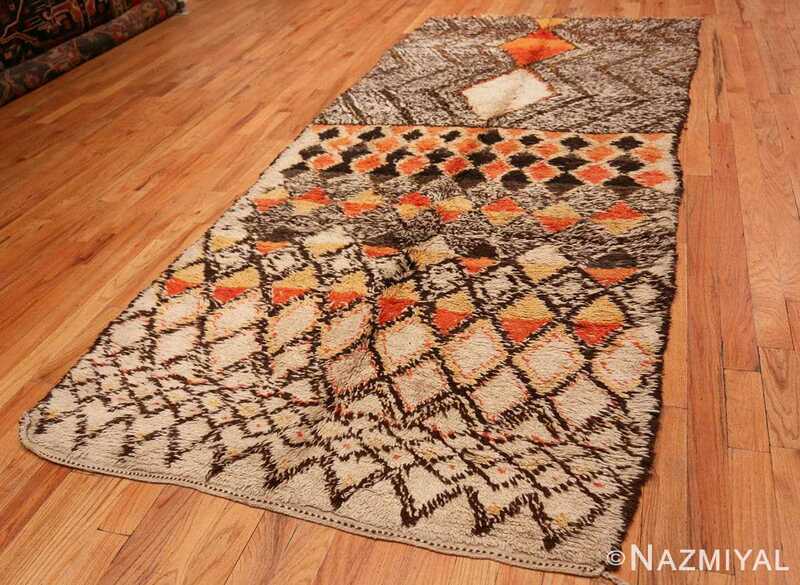 Each rug is a one of a kind reflection of the artist who created it. 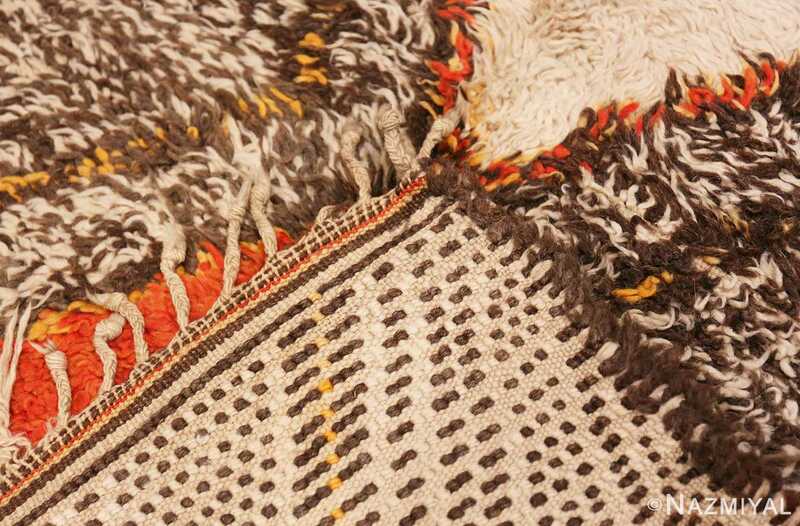 This makes each one a piece that will be loved for many decades and that is destined to be to become a heirloom handed down through the generations. Broad rhombus figures are impressed on the ivory field by the interplay of the dark brown detail lines, which create a solid structure throughout the carpet. This dramatic 20th century Moroccan carpet depicts a striking double-lozenge medallion accented by suggestive duality symbols, geometric details and tribal devices.